Thimbleweed Park is representing more than a step into a strange village with oddball characters and a mysterious past. It also feels like the next step in a classic genre. Shacknews takes a peek from this year's Game Developers Conference. Thimbleweed Park is a game that has a firm grasp on some of the best elements of the past. And for creators Ron Gilbert and Gary Winnick, that means more than just returning to the style of old-school LucasArts adventure games, like Maniac Mansion. The Kickstarter-backed point-and-click adventure feels like a natural extension of those games, retaining many of the genre's classic elements, while improving upon several of those ideas and building upon them. Shacknews recently had a chance to check out Thimbleweed Park at this year's Game Developers Conference. If there's one thing to say about Thimbleweed Park's narrative, it's that it definitely feels strange. Inspired by oddity-filled dramas like "Twin Peaks," the game follows a pair of detectives that investigating a mysterious body underneath a bridge in the titular town of Thimbleweed Park. Players can switch between both Agent Ray and Agent Reyes (who give off a Mulder and Scully vibe) at any time to help their investigation, but interestingly, Gilbert does not call the game a detective story. The body is meant to be a larger plot device that drives the story of what exactly Thimbleweed Park and its strange happenings are all about. 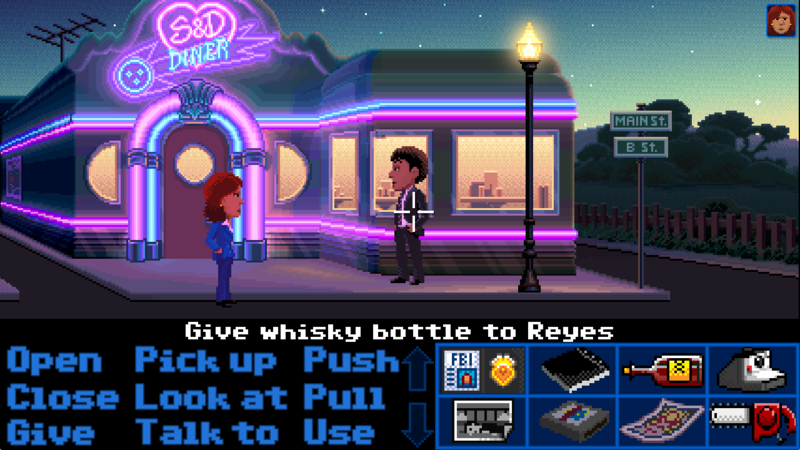 Thimbleweed Park retains the LucasArts interface, but there are some noticeable improvements. Visually, the game is fixed to HD widescreen formats with brighter lighting, greater shadow effects, and improved parallaxing. This maintains the feel of an original LucasArts adventure, but one that's upgraded just enough to feel like it belongs in 2016. Meanwhile, the character switching also works with the classic interface to help with puzzle-solving. If there's an item that's suited to one character, the other character can select "Give" to pass along inventory between characters. Gilbert is also heavily aiming to better streamline the old adventure experience, looking to capture the charm and reduce "stupidity." To that end, Thimbleweed Park's design aims to increase clarity, giving players a better idea that they're making progress. The intention is to increase the game's sense of focus to help reduce players getting stuck and wandering aimlessly for hours at a time. That's not to say the game will be too easy. Gilbert is satisfied with the challenge level thus far, but those still aiming for a more LucasArts-style challenge can start the game off on Hard difficulty. Those playing on Normal will see the game's most obtuse and challenging puzzles pre-solved to help keep the story flowing, but anyone that opts to play on Hard must solve those tougher puzzles on their own. The game will also grow more complex are newer characters are introduced. All of these playable characters are introduced via playable flashbacks, such as the oddball introduction to Ransome the Clown, a foul-mouthed entertainer that has been cursed to wander the Big Top in his clown makeup for the rest of his days. There are five playable characters in total, each of whom have their own specializations and puzzles suited to them. To further that idea, all of these characters will have their own special ending (in addition to the main story's conclusion) that players can track down. While the recent LucasArts remasters from Double Fine are a neat jump back into the past, Gilbert and Winnick's Thimbleweed Park feel like the genre's next step. Little things matter and the idea of being able to swap inventory back and forth, as I peer into a more detailed setting, feels like the kind of thing that keeps a classic genre feeling fresh. Two separate difficulties is also a nice way to keep the classic fans satisfied, while also attracting a newer generation of puzzle solvers. Thimbleweed Park is almost ready to embark on its adventure, with Gilbert saying the game is 80 percent finished. The game does need voiceovers and the team will be searching for voice actors very soon. It's estimated to release near the end of 2016, but could slip into the early part of 2017, on PC. Really eager to play this. I thought Ozzie left shacknews. I can't wait for this. But. I'll have to.